In the struggle for a peaceful and caring society, which allows each human and animal individual to develop freely and live in freedom, much will depend upon in how far the freedom of humans and animals will be recognized as being entangled. No less important will be that humans will develop a need to overcome the current repressive conditions and are willing to fight for that revolutionary perspective together with other emancipatory forces in their daily and political practices. 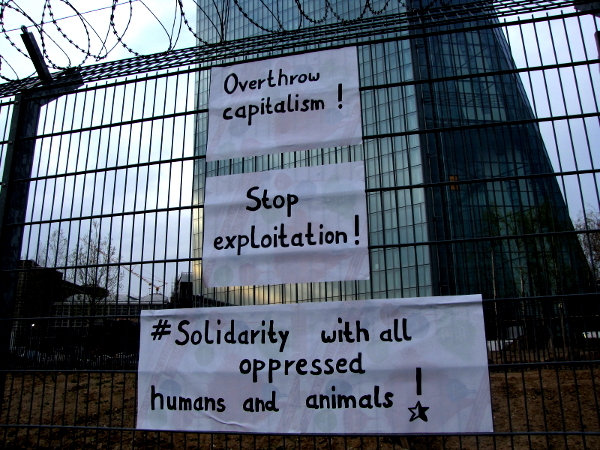 The actions of the transnational alliance Blockupy against capitalism, exploitation, exclusion, poverty, de-democratization and erosion of solidarity provide an opportunity to get involved with the united struggle and to eliminate the self-limitation of the concept and practice of animal liberation as well as their reduction by others to a single, marginal issue or one of particular interests. The alliance „Animal Liberation goes Blockupy“ calls for supporting Blockupy again in 2014 and to take the opportunity available to the animal liberation movement. It goes without saying that this call is addressed to activists who are opposed to oppression, exploitation and discrimination of any kind and of all humans and animals and who share emancipatory ideas and a left critique of capitalism. Likewise the whole Blockupy alliance, we will formulate a clear critique of nationalism, anti-semitism, anti-ziganism, islamophobia, racism, sexism and homophobia and all reactionary forms of Euro-skepticism. This year’s protest of Blockupy against capitalism, the European Union crisis regime, the Troika and related to them the oppression of humans and animals as well as the destruction of nature starts with a transnational week of decentralised actions from May 15-25, 2014 – the week before the elections for the European Parliament. As decided during the transnational meetings of Blockupy, the common slogan of our connected struggles will be „Solidarity beyond borders – Building democracy from below“. We will work on the keywords of Commons, Democracy and Solidarity to frame the perspective of our protest. The alliance „Animal Liberation goes Blockupy“ (in German: „Tierbefreiung goes Blockupy) has decided to focus on the meat industry – farms, transport of animals, slaugtherhouses, meat-cutting plants… – during these days of action and to confront their killing of animals, their exploitation of animals and workers, as well as the climate change, environmental destructions, land grabbing and hunger caused by them. Please take initiative, be part of it and send us your action reports, pics, video and so on afterwards so that we can publish them on our website. 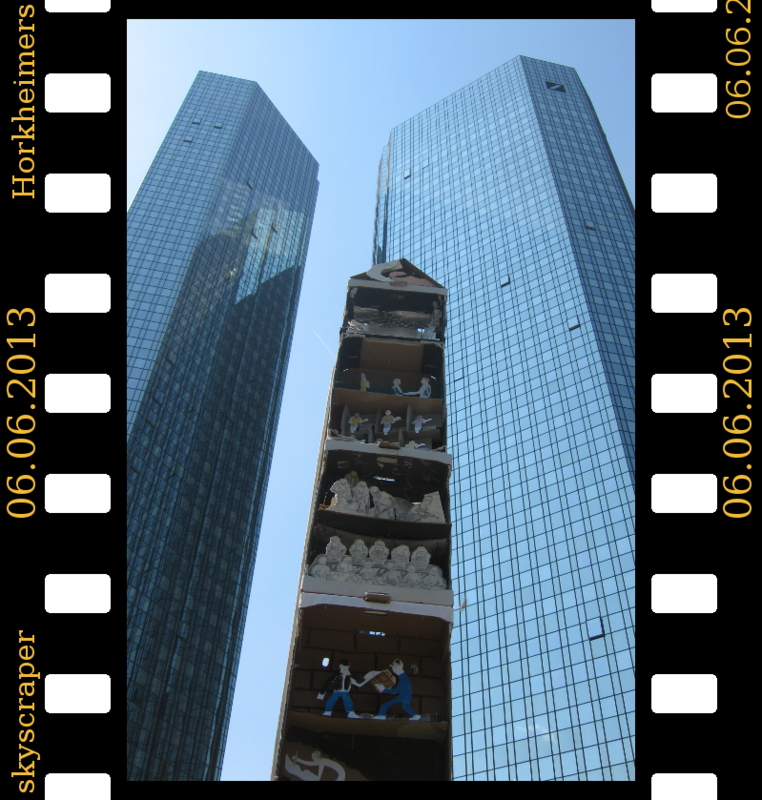 In autumn, the different social struggles and movements will bundle their strength again – this time to prevent the new tower of the European Central Bank from opening in Frankfurt (Germany). Since the European Central Bank has not announced a date yet, Blockupy mobilises for the day X in autumn/winter to come together in Frankfurt. It is planned to have several days of actions, a congress, an exhibition, a concert, a camp, and much more. You will find further information on the websites below. 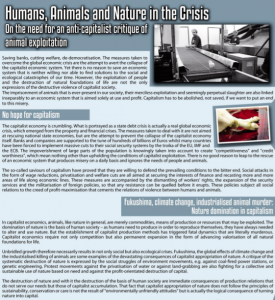 Raise awareness within the radical left and the Blockupy alliance that animal liberation is essential to the life of the animal individuals and an important part of the struggle against oppression, capitalism and class society. Look for new allies. Ask and support the animal rights/liberation movement to advance their work on an analysis of society within the framework of Blockupy’s protest. Make known the existing different positions and their socio-political consequences and identify contradictions. Develop jointly with other activists of the animal liberation movement why its objectives are linked to the other objectives of the radical left. Develop an emancipatory analysis of society within the Blockupy alliance and on the basis of joint experiences gained with the struggles. Elaborate possible options of how to fundamentally change society together, and attempt to achieve these changes. To be able to perform these tasks we need the help of many activists. We call for being part of the protest and to get involved with either „Animal Liberation goes Blockupy“ or the Blockupy alliance (check out on their website which groups of the country where you live are allies of Blockupy and what is already planned in your area).